Harry’s birthday weekend in Nottingham. My boys are 13 now and to celebrate the arrival of their teenage years I wanted to do something a little special for them both. 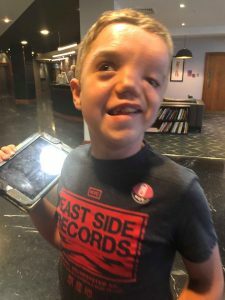 You may have read my blog on things to do in Rome which I wrote with Oliver when we came back from 4 days there which I had saved long and hard for as Oliver has long been fascinated by the Colosseum. For Harry, the surprise was slightly harder. Its really difficult to know what to buy for a child who literally wants nothing and I guess it is easy in many ways to buy safe, noisy gifts with little meaning based on the assumption that they don’t really understand anyway but that’s never been my style. I got my thinking cap on and came up with a plan that excited me JUST AS MUCH as 4 days in Rome! Many of my followers know that Harry is obsessed with remote controls but lately he’s also shown an interest in clocks. I had no idea if Panasonic would allow us a tour around a factory but I did find a clock museum in Nottingham and went from there. 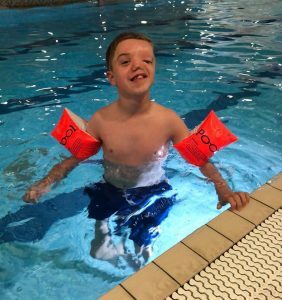 I looked for hotels with a swimming pool as I know that Harry absolutely loves the pool and if he became distressed at all in unfamiliar surroundings, the promise of a swim would make him happy again. 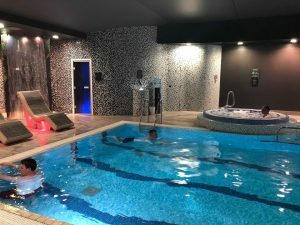 We settled on the crowne plaza and though I didn’t intend to review the hotel, I absolutely will (more on that in a minute). The Museum of Timekeeping is only open on a Friday and so I booked 3rd August for our trip. Incidentally, that’s also the date of my late Nans birthday and so the weekend suddenly had extra emotional significance. The museum was just that – a collection of beautiful, weird and wonderful clocks spanning decades. There was a room dedicated to the speaking clock (place your bets on how many times Harry will now call the speaking clock off my mobile phone – the closest guess gets to pay my bill for the month!) 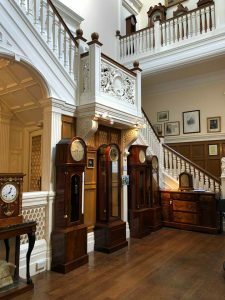 There was also the electric clock room, clock and watch workshops and grand hall. We had a fantastic leaflet and children’s activity booklet as we entered and I have to say that I was really impressed. The museum is staffed by lovely volunteers who were only too happy to chat with us about the various time pieces. 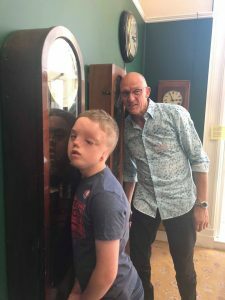 In the electric clock room, there was a lovely moment where Harry placed his ear on the glass case of a tall clock to listen the ticking. 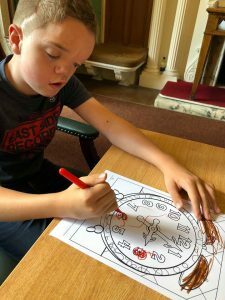 Years ago, I may have pulled him back and apologised for the sweaty ear mark on the glass but with age and experience of ASD children comes a relaxed understanding that this is exactly what my boy needs to do and so I stood with a smile on my face, unapologetically proud that my boy was interacting with the clocks in the way he needed to. Brian the volunteer was lovely and rather than looking concerned, actually copied Harry as he realised he’d never heard the clocks that way. There are fewer beautiful sights than someone accepting a childs’ needs and joining them in that moment. Brian also took the time to explain to Harry about the names of the parts. He asked me if he could understand and, in all honesty, I don’t know the answer to that but I said that I always like to tell him anyway and so Brian continued, even encouraging Harry to wind one of the clocks up with him. Just brilliant! After the museum we travelled 45 minutes back into Nottingham to the hotel. As I say, I hadn’t intended to review the hotel but it was so fantastic that I really couldn’t not! So many people are quick to complain and yet don’t take the time to recognise great service when they receive it so here is ours! At check in, we were given a couple of free drinks vouchers and asked if it would be better for me and Harry to be on a higher or lower floor (I chose higher as he loves the lifts). Every single member of staff made time for us from the reception, bar, breakfast, spa and even the maintenance man in the lift. 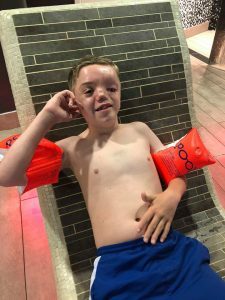 The pool was lovely and we spent a good couple of hours in there along with the jacuzzi and on the heated beds which I fear Harry may now expect at every hotel pool we visit! The hotel feels big, plush and great quality but has the intimate personal atmosphere of a small family guest house. Honestly brilliant and I’m already looking forward to going back! The food at dinner was better than I have had at some restaurants, and much cheaper! Check out wasn’t until 12 pm too which was great for us as we were able to chill in the room for a while before heading out. 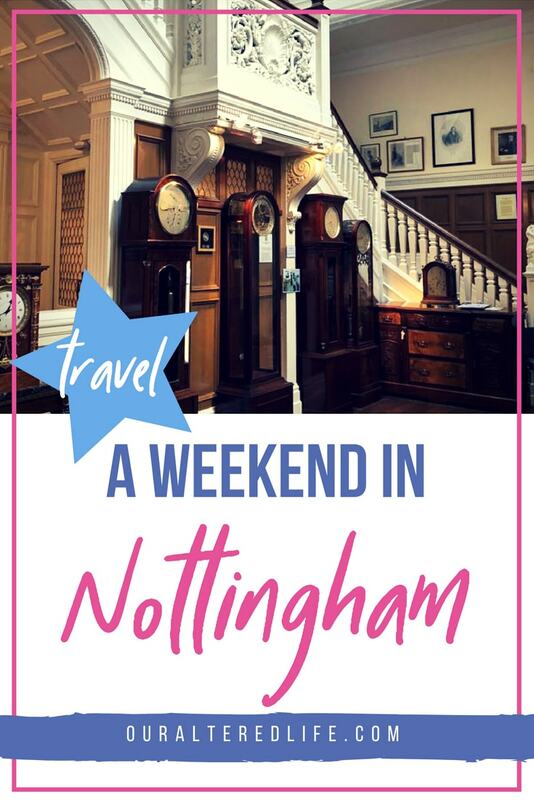 I have to admit that I was very nervous about heading out into Nottingham with H. I don’t know the city at all and getting lost or double backing is guaranteed to have Harry in a meltdown so I felt the pressure of planning routes around an unfamiliar city. A lovely lady in the hotel pool told us about the riverside festival which we could reach by car or tram. 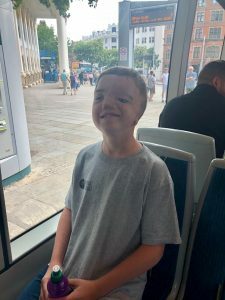 Although a car would feel a little safer for me, I knew from our visit to Blackpool while Oliver was skiing with his dad a couple of years ago, that Harry would love the tram so I had a worry wee, doubled up on rescue remedy and headed out! Harry loved the tram as I knew he would and after hearing on reception that you could win a minion he was adamant that this was our first stop. 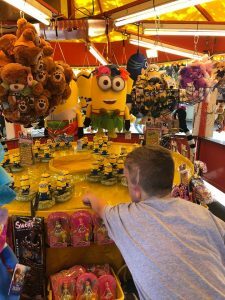 We headed straight for ‘hook a duck’ or the ‘sell your kidney to afford some cheap tat that you’ll never use stall’ as I like to call it and despite paying £7 for Harry to get the minion he had been asking for he was suddenly undecided. He spent 20 minutes or so debating what he wanted and, in the end, cuddled in to me, weary from thinking and so I chose for him. This pretty much set the tone for the next few hours. 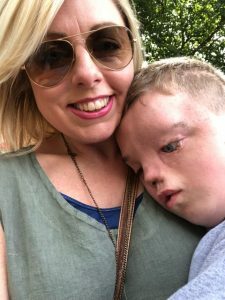 Harry, usually very keen to try all the adrenalin rides, refused to go on anything except for the waltzers and that was only because I dragged him on although he did laugh lots as I tried to hold on to my breakfast. He wasn’t particularly interested in playing the other games and struggled to eat his ice cream as we sat at the side of the river soaking up the sunshine. He became agitated a couple of times and when he suddenly asked for the toilet I knew that my feeling that his mood was linked to this was correct. As soon as he had been to the toilet (for a number 2) he was much calmer but I could see that he was physically drained. 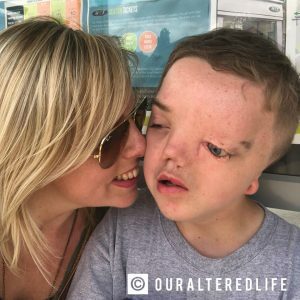 We had a burger and headed back to the tram which he loved again. Within a couple of hours, we were back at home and our adventures suddenly seemed like a long time ago! I have no way of really knowing how much Harry enjoyed the weekend. 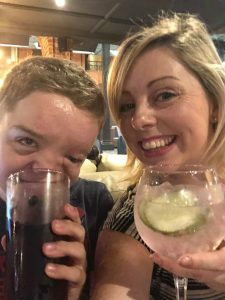 But what I do know is that I lost count of the number of smiles that radiated from my boy, the amount of times he stroked my hand gently and slowly saying “muuuuuummy” and the number of times I felt so very happy that we were together. I could never have imagined that right at the beginning. When I was blinded by grief and consumed by guilt. Back when Harry frequently had huge meltdowns and lacked the receptive language to understand my attempts to comfort him. Back when I feared that I would never be the mum this boy needed. They say that time is a healer but its also a teacher. 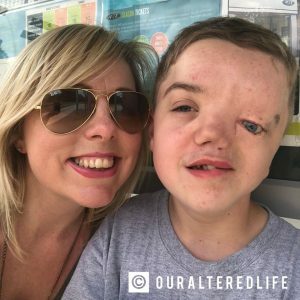 Time has taught me that I am more capable than I could have ever known and that I am exactly the mum my boy needs. Experience through the years has helped me to understand (and avoid) Harrys triggers and the non-verbal understanding that replaces language between us is like a beautiful slow dance without any music. Our silent steps in perfect time even if it is more cha-cha than waltz. 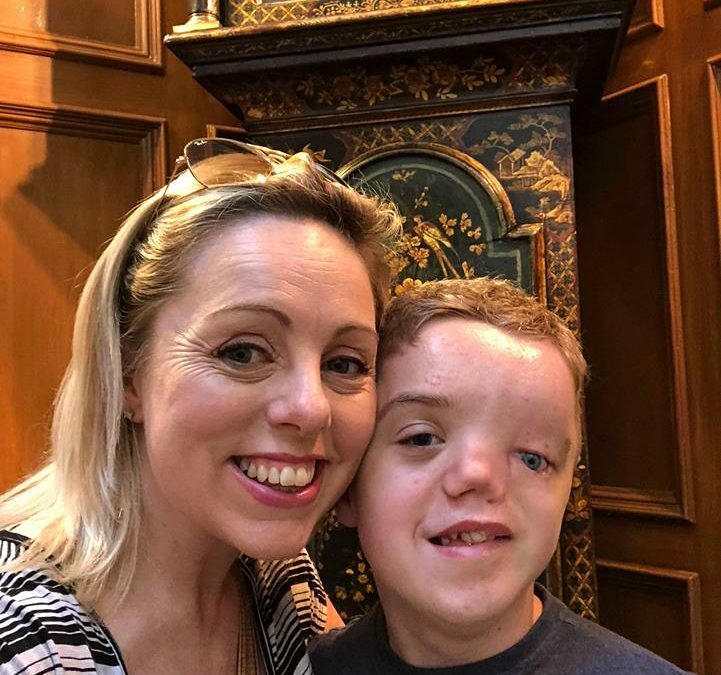 No, life isn’t always easy but that shouldn’t mean I relegate Harry to a life less than brilliant and I will try for as long as I can to make sure that he knows he is loved and that there is a world out there that he is a valued part of. Even when he costs me a small fortune on hook a duck! It means a lot to me that you're reading my blog. Please share and don't forget to subscribe to get regular updates.